You will find quite the list of invasive species on the Department of Fish and Wildlife page. There are a couple we would like to point out at boaters. 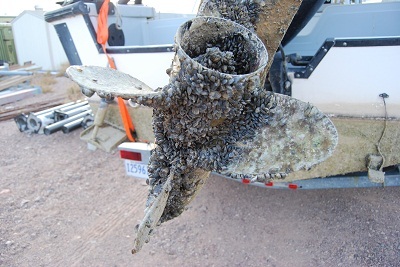 Quagga/Zebra mussels – They look like mini mussels and attach to anything in the water, especially your boat. If you see these, please report them. Also, note there are special steps involved to be sure these guys don’t survive the cleaning process. It doesn’t take long for these guys to take over a lake. We want to keep these out of Washington. If a boat comes in from out of state, pay extra attention! Invasive Tunicates – This is for our salt water boaters, keep an eye out for these. If they end up on your boat, clean them off and dispose of them in the trash, not the water. Aquatic Plants – Milfoil is the most common one here. Again, keep an eye out for plants that get caught on your boat or trailer, clean them off and throw them in the trash.